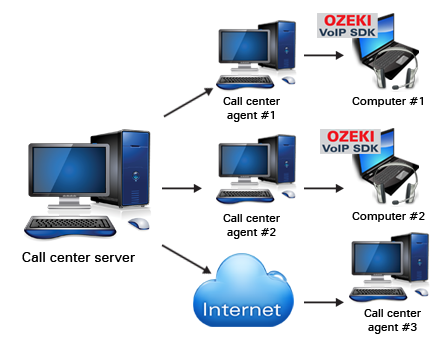 This article introduces the best way to connect remote call center agents to a call center over the Internet when you use Ozeki VoIP SIP SDK. After reading through this page you will be fully familiar with all the essential terms concerning call center connections and what you will need for creating your own solution using Ozeki VoIP SIP SDK. The call center agents are people who receive the incoming calls in a call center. These agents use call center client applications or a simple telephone set for answering the calls. The incoming calls are usually routed to the agents according to some rules from the call center server that is the program that actually receives the call from the outside world. The call center agents are usually working in the same office, but in a VoIP solution there is no need to be at the same location to be able to provide customer help service. In this case there is a possibility for the call center agent to run a call center client program that connect to the call center server through the Internet from any place that has an Internet connection and the server can transfer the call to the remote client as simply as it was in the same room. The support for a remote call center agent is usually not the question of communication protocols but security. The easiest way is to use simple VoIP connection like in case of a standard softphone, for example, but the call centers needs to be connected to some database tables where they can browse for customer data etc. that needs some additional security settings. Ozeki VoIP SIP SDK provides great support for call center development along with other VoIP solution, you only need to decide what solution you build and you can call the provided methods that do the hardest part for you. This article introduced you the best way to connect remote call center agents to a call center over the Internet and showed how Ozeki VoIP SIP SDK can help you to fulfill your goals. If you have read through this page carefully, you already have all the knowledge you need to start on your own solution.